The Jungle Book is a 1967 American animated film produced by Walt Disney Productions and was released on October 18, 1967. It is the 19th animated feature in the Walt Disney Animated Classics series. It was inspired by the stories about the feral child Mowgli from the book of the same name by Rudyard Kipling. Directed by Wolfgang Reitherman, it was the last to be produced by Walt Disney, who died during its production. The early versions of both the screenplay and the soundtrack followed Kipling's work more closely, with a dramatic, dark, and sinister tone which Disney did not want in his family film, leading to writer Bill Peet and composer Terry Gilkyson being replaced. The casting employed famous actors and musicians Phil Harris, Sebastian Cabot, George Sanders and Louis Prima, as well as Disney regulars such as Sterling Holloway, J. Pat O'Malley and Verna Felton, and the director's son, Bruce Reitherman, as Mowgli. 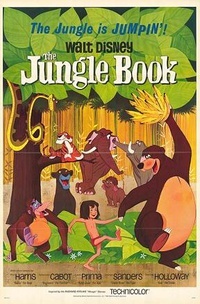 The Jungle Book was released to positive reception, with much acclaim to its soundtrack, featuring five songs by the Sherman Brothers and one by Gilkyson, "The Bare Necessities". The film grossed over $73 million in the United States in its first release, and as much again from two re-releases. • 'Dancing with the Stars' Spoilers: "Disney Night" movies, songs, dances and characters! This webpage uses material from the Wikipedia article "The_Jungle_Book_%281967_film%29" and is licensed under the GNU Free Documentation License. Reality TV World is not responsible for any errors or omissions the Wikipedia article may contain.